Published 11/7/2013 . Last updated 1/12/2019 . This chocolate turkey makes for such a cute Thanksgiving treat! 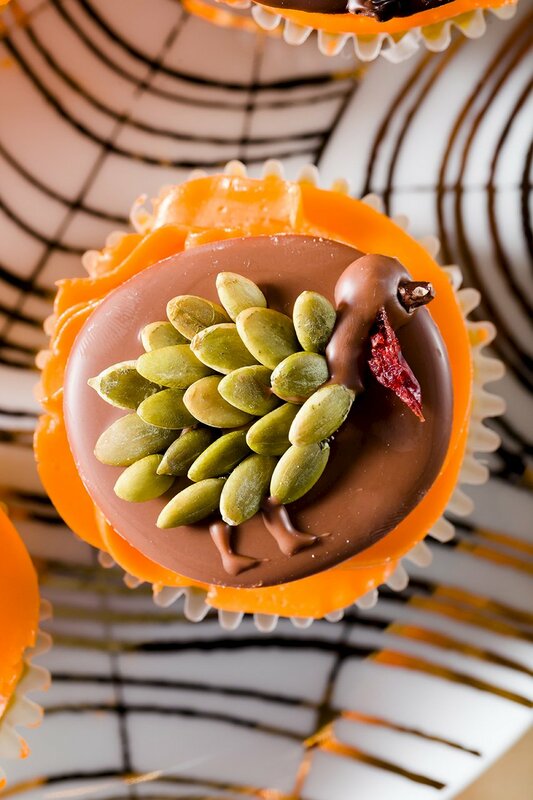 I went to the folks at Kakao Chocolate with an idea – I wanted to make chocolate coins with turkeys on them to put on top of cupcakes. And, I knew they could help. Jenny at Kakao suggested building the turkeys on chocolate discs using food items that they happened to have around the shop. We experimented a ton! We even had to pull up photos of turkeys on my phone to try to get the shape just right. In the end, we got the turkeys just the way we wanted them and they ended up looking (and tasting) better than I had ever imagined! The chocolate turkeys are very labor-intensive, but they are a fun and impressive project. I suggest making small batches to set at each place at your Thanksgiving table or to top several special cupcakes. You’ll need tempered chocolate. See my post on how to temper chocolate for an explanation of why this is important and how to do it. Hoosier Hill Farm Pumpkin Seeds - Pepitas, 1 lb. You’ll need pumpkin seeds (pepitas) for the feathers. Dried cranberries. We actually used scissors to cut dried cranberries in half. You just need a half cranberry for each wattle (the part that hangs down near the head) of each turkey. We used cacao nibs for the beak. You could also use nuts. If you want all of the discs to be the same size and shape, you can make them using a silicone cupcake tin. The flexibility of silicone makes the discs easy to pop out. I didn’t think of this until after I was all done with my discs, so I haven’t tried it firsthand. I think this technique would work well, as it did with my homemade white chocolate. However, it would be harder to place the turkey parts while reaching down into the cupcake cavities. If you are anything like me, you’ll end up making a bunch of ugly birds before you get the art of turkey-making down. Don’t worry – ugly turkeys still taste great! A cute chocolate turkey to put at Thanksgiving place settings or to top cupcakes. Fill a piping bag with warm, tempered chocolate and cut a small hole across the end of the bag. Pipe a few circles of chocolate onto parchment paper on a baking sheet, the inside of a silicone cupcake tin, or chocolate disc molds. Don't make too many circles at once or you won't have time to attach the seeds before the chocolate hardens. Bang the baking sheet, tin, or molds against a table to smooth out the chocolate. This makes a huge difference in the appearance of the discs. Starting with the feathers in the back of the turkey, layer seeds to form feathers matching the image above. Pipe a neck, head, scrawny legs, and feet out of chocolate onto each disc. Attach the cranberry and the nib. Leave at room temperature to harden. If not eating immediately, store in a sealed container. These are fabulous. Love em! They are so adorable! Love them! So cute! I love that you collaborated with Kakao- everything that they make is magical! Important facts. Blessed my family I came across your website inadvertently, and I am shocked precisely why this particular accident couldn’t took place before hand! I personally saved it.